Trim the leeks, slit them from top to bottom and rinse very well under cold water to remove any dirt. Place the leeks in a large pan, preferably so they lie flat on the base, cover with water and add a little salt. Bring to the boil, cover the pan with a lid and simmer for 5 minutes until the leeks are just tender. 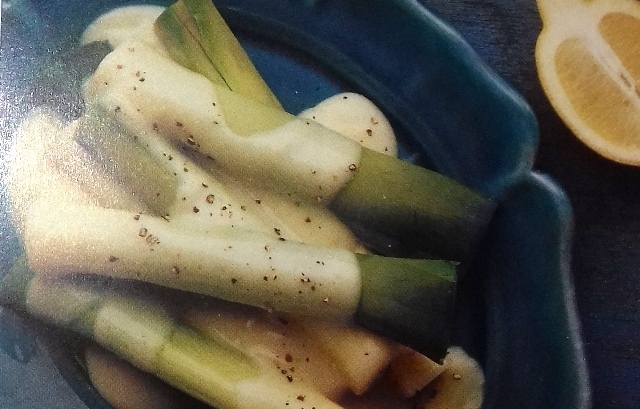 Carefully remove the leeks using a slotted spoon, drain well and arrange in a shallow serving dish. Reserve 200 ml of the cooking liquid. Blend the corn flour with the cooled cooking liquid and place in a small pan. Bring to the boil, stirring all the time, and cook over a gentle heat until the sauce thickens slightly. Stir in a the sugar, then remove the pan from the heat and allow to cool slightly. Beat the egg yolks thoroughly with the lemon juice and sir gradually into the cooled sauce. Cook over a very low heat, stirring all the time, until the sauce is fairly thick. Be careful not to overheat the sauce or it may curdle. As soon as it has thickened remove the pan from the heat and continue stirring for a minute. Taste and add salt or sugar as necessary. Cool slightly. Stir the cooled sauce with a wooden spoon to incorporate that skin that may have formed on the surface. Pour the sauce over the leeks, then cover and chill for at least 2 hours before serving.